There are approximately 271,000 women and over 1000 men who were expected to be diagnosed with breast cancer in 2005 according to the most recent statistics. Due to the ramifications of treatment, exercise is a modality that can be used to facilitate recovery. Numerous studies have demonstrated that exercise can improve quality of life, reduce side effects of treatment, and improve strength and endurance. However, it is essential that exercise professionals understand the various treatments that survivors undergo to provide safe and effective exercise programs. Using this multimedia course discover the restrictions and limitations of working with this population and specific recommendations regarding exercise protocols for both land and water exercise. Understand the stages of breast cancer. Describe the various surgeries and anatomical structures affected by breast cancer surgery. List local and systemic cancer treatments and side effects. Describe physical issues faced by breast cancer survivors. Describe psychosocial issues faced by breast cancer survivors. Explain special precautions and risk management related to both land and water exercise for breast cancer survivors. State the benefits of land and water exercise in breast cancer recovery. Describe HIPAA requirements and their impact upon client’s medical records. Describe cardiovascular recommendations for mode, intensity, and frequency if undergoing treatment. Describe strength training guidelines for clients at risk for lymphedema. List lymphedema advisories and lymphedema risk reduction techniques. 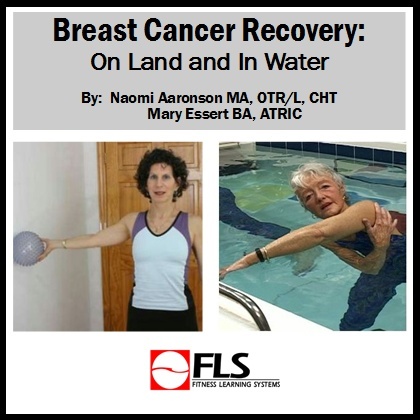 Demonstrate exercises for the breast cancer client on land and in the water. Identify when to refer clients out to medical professionals. Give examples of how to progress clients through aerobic, strength training and flexibility programming on land and in the water. Understand basic assessment for breast cancer clients.